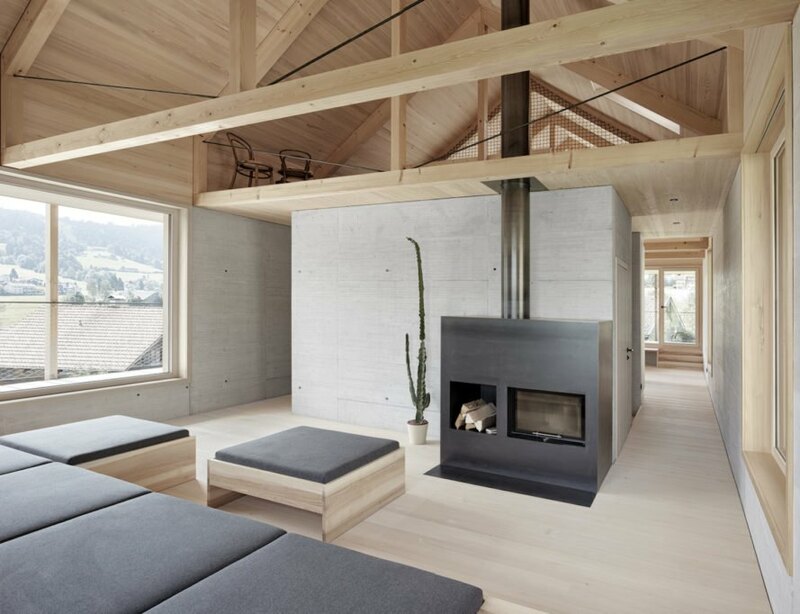 Lovers of minimalist architecture will swoon over Innauer-Matt Architekten’s Höller House, a beautiful modern home built mainly of wood in Austria’s picturesque Bregenzerwald valley. 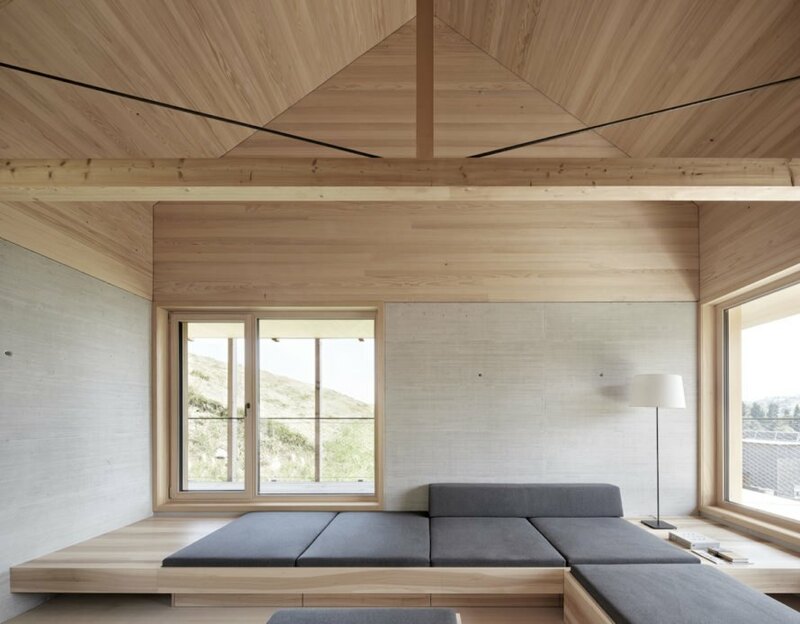 Set on a steep hillside, the dwelling combines inspiration from traditional farm buildings with a more contemporary vibe evidenced in its gabled form and restrained minimalist palette. Light timber is used throughout the home, inside and out, and is complemented by the structural framework’s exposed concrete columns. 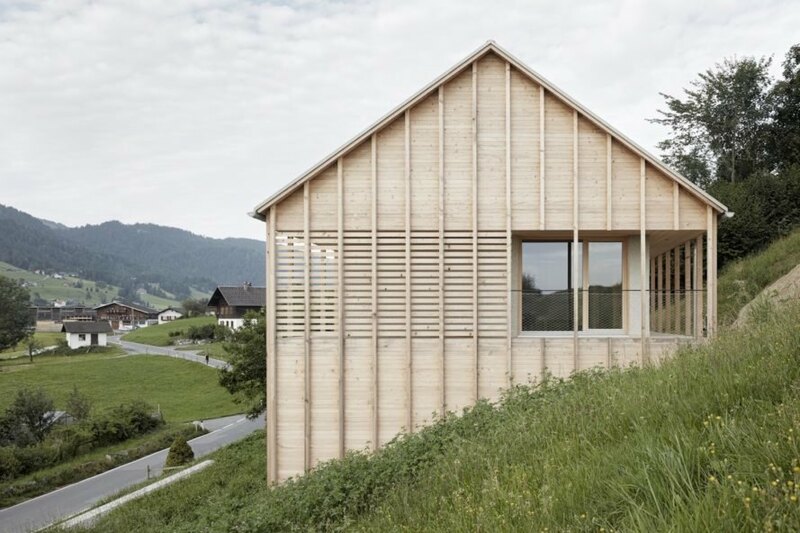 Built of timber felled from the homeowner’s forest, the 1,428-square-foot Höller House celebrates its timber construction with exposed wooden beams and surfaces left unpainted. Natural light fills the home through large openings and skylights, but privacy is also preserved by the slatted wooden facade and intentionally hidden entrance. To satisfy the client’s desire for a private outdoor space, Innauer-Matt Architekten added covered terraces that wrap around the home, a feature the architects call the “outermost shell.” The light-filled living and dining area serves as the inner “shell” and is organized around a core of exposed concrete comprising the staircase, toilet, and storage room. “This way we created a wide spectrum of translucence and transparency which we gradually and individually adapted to each room, its purpose and the level of desired intimacy, preventing unwanted insights while making beautiful outlooks part of every day life and living,” wrote the architects. 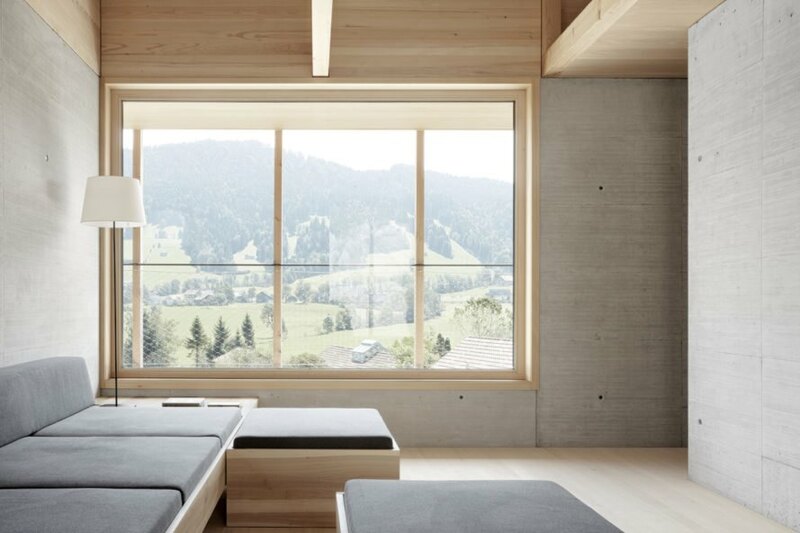 Lovers of minimalist architecture will swoon over Innauer-Matt Architekten’s Höller House, a beautiful modern home built mainly of wood in Austria’s picturesque Bregenzerwald valley. 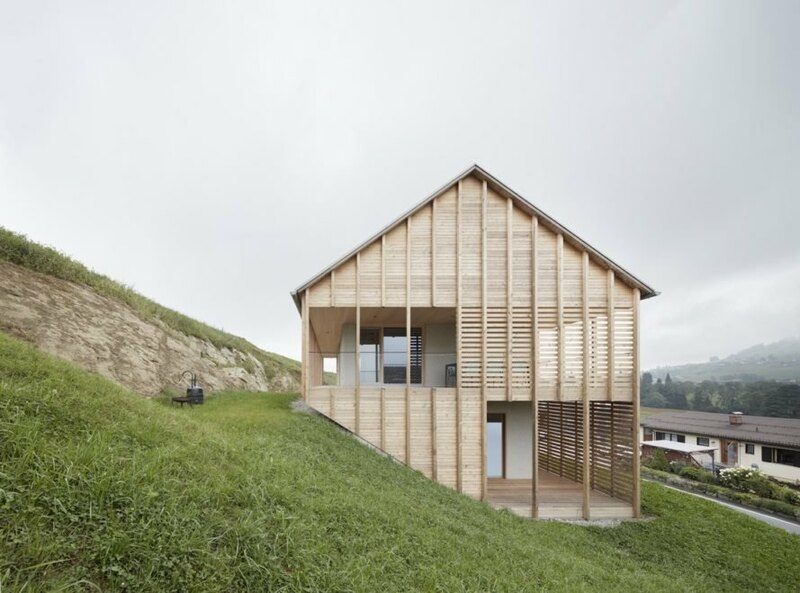 Set in a steep hillside, the dwelling combines inspiration from traditional farm buildings with a more contemporary vibe evidenced in its gabled form and restrained minimalist palette. 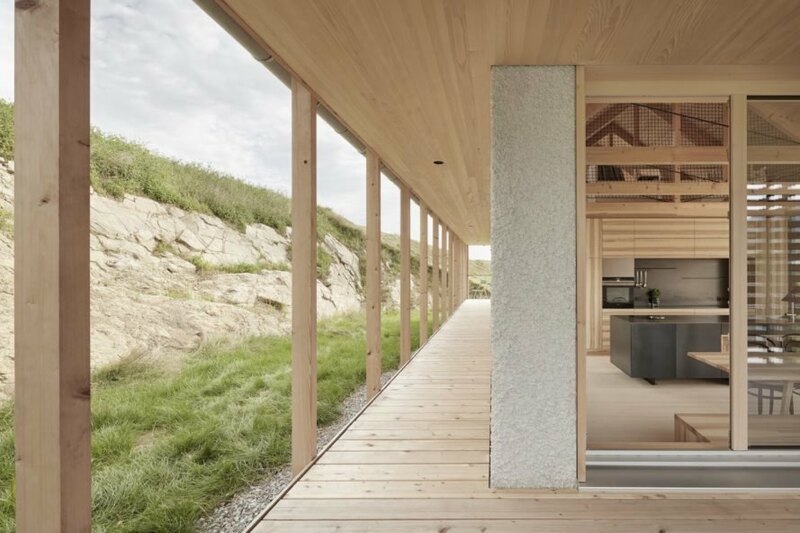 Light timber is used throughout the home, inside and out, and is complemented by the structural framework’s exposed concrete columns. 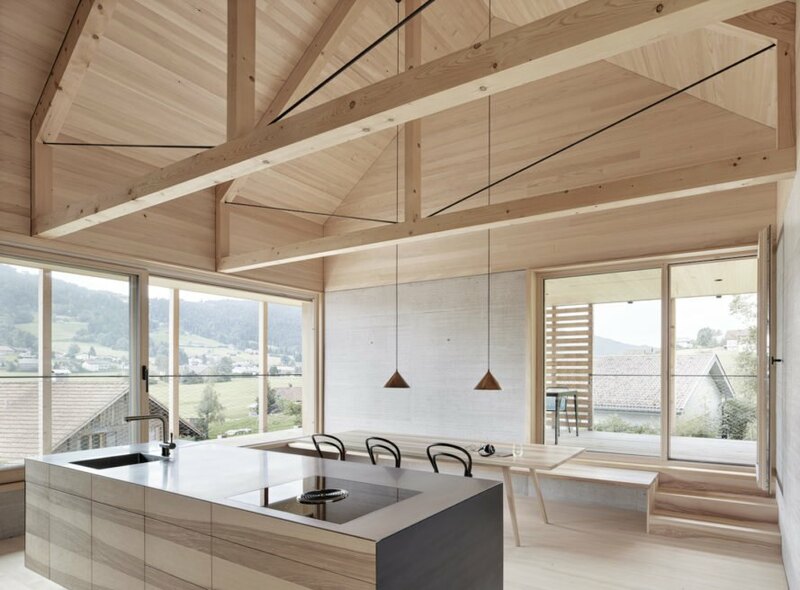 Built of timber felled from the homeowner’s forest, the 1,428-square-foot Höller House celebrates its timber construction with exposed wooden beams and surfaces left unpainted. Natural light fills the home through large openings and skylights, but privacy is also preserved by the slatted wooden facade and intentionally hidden entrance. The light-filled living and dining area serves as the inner “shell” and is organized around a core of exposed concrete comprising the staircase, toilet, and storage room. “This way we created a wide spectrum of translucence and transparency which we gradually and individually adapted to each room, its purpose and the level of desired intimacy, preventing unwanted insights while making beautiful outlooks part of every day life and living,” wrote the architects.